Many large ground based PV plants are now ageing, and are subject to increasing faults and failures, as well as deterioration due to aging and inspection and maintenance needs are increasing . Detection of such failures is difficult, taking the large number of panels into account. Aerial thermography and photography using unmanned vehicles, combined with digital twinning, is a possible solution to the problem. The common belief is that solar requires very little to almost no maintenance at all. This statement turns out to be true, but at the same time can be very misleading. Solar is an investment that is likely to last 20 to 25 years. In order to calculate an accurate return on investment, one must account for operation and maintenance (O&M) issues, as well as understand them to develop procedures for dealing with these issues in the most efficient and cost effective way. This is why the statement that solar requires little maintenance can be misleading. If the margins on the solar project are very low, and O&M costs are underestimated, this could result in an inaccurate expected return on investment, and the results could be economically disastrous. Once a fault or defect has developed on a solar panel, other than soiling, cabling or connection problems, there is little that can be done to correct it, and the O&M decision will reduce down to when to replace the panel. Ongoing monitoring of the condition of the solar panel and analysis of data will allow replacement decisions to be optimised. Faults may be classified as panel faults, and balance of plant (BOP) faults, such as cabling , connection boxes, inverters and other plant. BOP faults may affect individual panels or string performance. Detailed fault detection or performance measurement would require onsite measurement of panel performance characteristics, which would normally mean demounting the panel. Mobile test laboratories have been developed which can perform onsite tests on panels, but this requires demounting the panel and can be costly and time consuming. Many panel faults can be detected by visual imaging or by thermographic imaging means. Through the use of IR imaging, faults and damage that are otherwise invisible to the naked eye can be seen in the form of hot-spots. Thermographic analysis or imaging (TI) makes use of specialised infrared cameras to identify parts of the installation, which could be strings of panels, individual panels, or individual cells, where the temperature is significantly different from the surrounding areas. Temperature differences are indicative of faults or defects. Under operating conditions, the current flowing in the panel causes a temperature rise which will vary according to the state of the component. Faults will cause both hot spots and dead areas on an installation, which thermographic analysis will highlight. 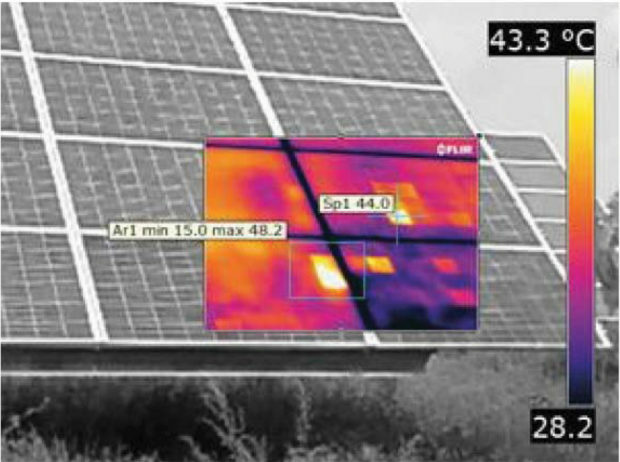 Fig.1 is an example of thermographic image of a solar farm, showing both healthy panels and panels with faults. A healthy panel will exhibit a uniform temperature profile. Fig. 1: Thermographic image of a solar farm (heliolytics). Offline string: A whole string of panels is disconnected and not producing power. he string will have a lower temperature than the rest of the installation. Errors in the laying out of the electrical installation-bypass diode etc. PID effect: The potential induced degradation phenomenon, first observed in the seventies, leads to a sudden decrease of PV panel efficiency. The general mechanism of PID is that voltage bias related with leakage currents pass from silicon active layer through the glass to the grounded module frame. A hot-spot initiates in a cell when, due to one or more of the above mentioned reasons, a change in the electrical behaviour of the cell takes place. The defective cell is forced to pass a current exceeding its generation capabilities, and it becomes reverse biased, entering the breakdown regime and subsequently sinking power instead of sourcing it. The cell behaves as a purely ohmic load, draining energy produced by the neighbouring cells. It has proven useful to capture visual images (colour) as well as thermographic data. Visual images can reveal damage to panel surface as well items such as snail trail defects (delamination). Colour images also help software identify the root cause of issues at the module level. For example, soiling and cracking issues may appear similar in a thermal image, but a colour image makes it easy to distinguish them . Imaging is non-destructive and non-invasive, and can be to inspect the solar panels under load, so no shutdown is required. When used properly, thermal imaging will show accurate temperature differences between cells or within a single cell that allow identification of faults at an early stage. Ground-based: Suitable for small installations and for balance of plant such as combiner boxes, junction boxes and other items normally located under the panels. Ground based imaging also allows the rear of the panel to be inspected, and can be used for follow up on faults indicated by aerial methods. Usually a single panel or small group of panels is inspected at a time. This method is generally used at the moment. Ground based imaging limits the angle at which a panel can be studied. Aerial-based imaging: This method uses either manned or unmanned craft, and allows the capture of data from a large number of cells in one image. It is very suitable for large Installations as images can be taken rapidly, under the same conditions for all panels. The use of unmanned aerial vehicles (UAV) or drones allows closer inspection and better control over the thermographic capture process, as well as reducing the cost significantly. Infrared cameras on UAVs are very easy to position at the right distance and angle to capture the optimum image. According to published information, a drone can survey 4000 panels in about five minutes, while a human inspection would take more than 8 days at a rate of one panel inspection per minute. Drone capabilities capabilities include remote sensing with LiDAR and infrared (IR) technology, high-resolution photography including UV and other spectral, and HD video. Drone based thermography allows a realtime analysis by connecting the camera to a ground based analyst, who can guide the pilot as to which panels need closer attention or image recording from a different angle. DBT allows the angle at which the panel is inspected to optimised, as the camera is not fixed but can be rotated. Fig. 2: Drone-based inspection (Workswell). Identifying malfunctioning units in an array. Performing preventive maintenance. Panels, mounting systems, wiring, monitoring equipment, and other plant components can be visually imaged for dust and dirt, snail trails, leaves, corrosion, defects, cracks, and water or insect intrusion. Monitoring vegetation to keep foliage from casting shade on strings. Detecting equipment that may be in danger of overheating (combiner and junction boxes, inverters). Assessing damage following wind, seismic, flood, fire, or electrical storm events. Monitoring fencing for security purposes. Drone inspections can generate hundreds or thousands of images per site. However, the consistent geometry of PV systems allows for the separation of modules and the use of artificial intelligence to diagnose module defects, while simultaneously assessing and comparing the hierarchy of subsystems such as module versus module or string vs. string. Capturing the images is only one part of the process, the second is to analyse it. It is not necessary to inspect each image to identify problem areas, as software is available which can automatically identify specific problems. Using GPs it is able to automatically locate where the problem areas are. This is made possible by “geotagging”of each thermographic image, so that processing of captured date will indicate precisely which solar panels need attention. The software allows selection of temperature ranges to be used in the search, so that only items that exceed the preset level are tagged . Fig. 3: Picture-in-picture feature . Some cameras combine top-notch image quality with advanced features like wireless Wi-Fi connectivity with a tablet and test-and-measurement tools. These wireless connections make a huge difference. Another feature available is the picture-in-picture feature. This overlay of a thermal image over the visual image allows better localisation of hot spots. 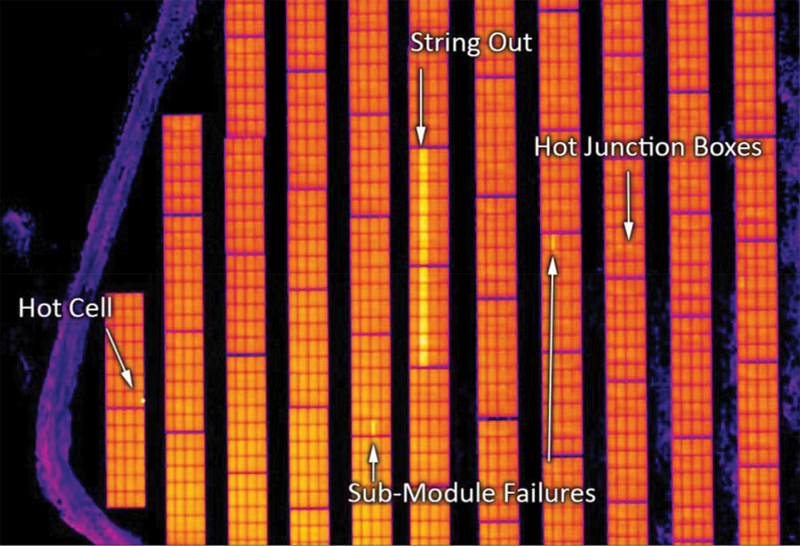 To optimise time savings, drone data capture should be matched to the specific management goal, such as identification of off-line PV source circuits or module-level cell defects . The Enertis organisation is using drone based thermography for solar analysis on South African installations. Digital twinning as a maintenance tool for ground based solar. How can the massive amount of information collected by photography and thermography, be managed and be put to use? A method that is gaining acceptance in other sectors of the power industry is “digital twinning”. Digital twinning consists of the mapping of physical assets onto a digital platform. For the energy industry, this could be a solar farm, nuclear facility or traditional coal plant. The digital replica uses data from physical assets, for instance, the data acquired from the thermographic analysis, or real time data from the inverters or other items at the solar farm, to analyse its efficiency, condition and real-time status. The process involves creating a “digital twin” (DT) of a system such as a substation or generator plant and using the information from the twin to monitor and manage the real system. The DT usually consists of a 3D image of the item, and contains information, both historical and real-time on each component of the system. Thus the characteristics and specifications of each item can be accessed as well as real-time performance information. The DT is also capable of combining performance data to show trends and variations over groups of components. DT systems were first applied in the infrastructure construction industry, to manage the many components in complex structures, but has been extended to include dynamic performance details of power, water HVAC etc. The principle has been applied to large machines, by including large numbers of sensors in the machine and using these to generate the DT of the machine, which gives information on such things as temperature profiles, vibration etc., in real time, and is now being applied to distributed generation plant such as solar PV farms. Fig. 4: Digital twinning of solar plant (GE). Digital twins are best created at the design phase, where information on every component, including expected performance, can be entered. DT has been applied on a limited scale in several large solar farms . Ideally the DT should incorporate real-time performance data on every panel, but this would require several hundred thousand entries, and monitoring of the performance of every panel, so the existing models tend to focus on consolidated real-time data such as that available from inverter stations. Thermographic and other panel specific status information, on the other hand, could be included on a panel by panel basis. DT could be used to provide a visual model of the entire plant, identifying areas of high temperatures, hot spots or areas of high soiling, physical damage, etc. Identifying areas with possible problems could make the physical location of such problems much easier. Using a digital twin, the replica can inform when an asset begins to show signs of non-optimal performance, without having to access the physical asset. This could give an indication of when the asset could fail, minimising the risk of unexpected downtime. Gaining this insight into upcoming issues allows maintenance decisions to be made based actual data, as opposed to pre-defined maintenance schedules or guesswork. Assets can then be kept at their optimal level for maximal profits, rather than performing random, reactive maintenance when a part breaks down . Digital twinning provides asset owners with enhanced real-time analysis and critical efficiency parameters, it also prevents downtime by extending its application to predictive maintenance and efficiency optimisation. Predicting equipment failures and non-performance of assets using digital representation, can improve uptime and excessive physical repair costs, especially in cases where scheduled calendar maintenance and reactive repairs increase asset downtime. Distributed generation technologies come with their own set of challenges. Managing the variability and intermittency of solar is important to improve asset performance and to keep the asset running at peak performance. Asset operators can optimise DR management by monitoring solar radiation and weather patterns, and forecasting demand-supply aggregation. Solar projects are each made up of tens of thousands (even millions) of individual solar panels as well as other pieces of equipment. Each panel, if from a reputable manufacture, has its own performance specification, and this can captured at the construction stage. It is not considered to be useful to monitor the performance of individual panels, but this information can be used to create an expected aggregate performance for a group of panels, which can be measured and monitored. DT allows a visual indication of the aggregate performance of groups of panels as well as the total installation. What is the twin of a solar project? Is it the entire plant,or the inverter “string” of hundreds of solar panels. The level of aggregation to which the DT needs to drill down, will depend on the system design and other factors, such as site specific variations. As processing becomes cheaper, as sensors become cheaper, as sensors become better, as data transmission becomes both, the level to which the digital solar twin can go will increase. There are several solar sites where digital twinning is being piloted. Sites piloting DT at the moment tend not to go further than the inverter level, but plans are in place to drill down deeper into the systems, as experience is gained . 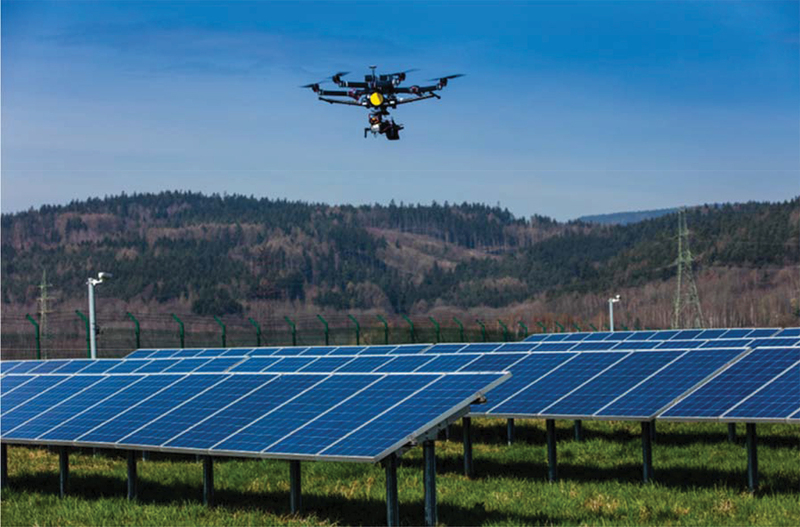 S Duffin: “Using drones to speed up solar utility inspections”, Renewable energy world, June 2018. “How digital twins are changing the energy industry”, PEI, August 2018. A Mohammed: “How Digitalisation Is Ushering in a New Solar Era”, Renewable energy world, July 2018. R Heijsman: “Inspecting solar panels with thermal imaging”, Maintworld, 2014. The post Drone-based thermographic imaging offers fast and accurate solar farm inspection appeared first on EE Publishers.